KEM playing cards, including the KEM Arrow cards and the KEM Paisley cards, are always welcome for the special back with high quality. Also they are expensive playing cards than other brands of cards. Many guys ask for KEM marked cards for infrared contact lenses but always do not accept the price. Usaully KEM contact lenses marked cards takes more time for marking, needing very special invisible ink, and being easy to break. Thus they are much more expensive than other marked cards. 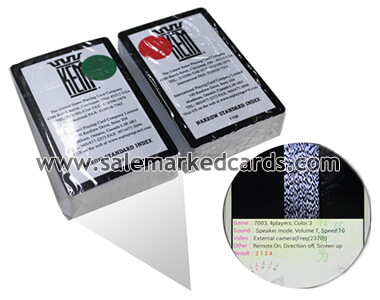 In fact, It is a better way to buy the Kem marked cards with invisible unk mark on barcode for poker analyzer. They are easier to mark than that with invisible ink marks for infrared contact lenses and easy to keep as well. Just feel free to contact for any KEM marked cards!